To reuse water is vital for life and health. 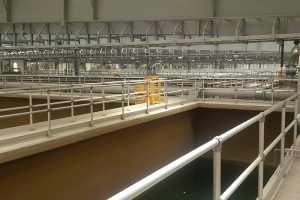 Especially in dry areas like Oman where water is a very valuable resource, Sewage Treatment Plants (STP) play a crucial role in the water infrastructure. As much as clean water is relevant for the health of many people, safety solutions like guardrails from Kee Safety LLC are for installation and service workers on the STP sites. 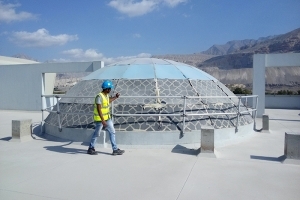 One of the major STP sites from Haya Water in Oman is working with the solutions from Kee Safety LLC to protect their employees and service suppliers like Aquajet LLC from any hazard that might happen with installation and repair services in difficult access locations. In this project the customer decided to make manholes safe in different places on the STP site. 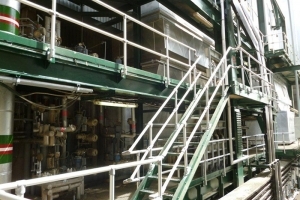 The flexibility of the design, construction and material of our comprehensive KEE LITE product range came into play as the conditions were specified: Anodized aluminium fittings and tubes were used to provide the relevant corrosion protection for the harsh weather environment.